8/09 - 5/10, Ted Scripps Fellow in Environmental Journalism at the University of Colorado. 10/08, Best Non-Fiction Award Winner in the National Best Books 2008 Awards presented by USA Book News. 6/05, First Place Self-Illustrated Story, Lowell Thomas Awards of the Society of American Travel Writers. 6/05, First Place Feature Story, Connecticut Chapter of the Society of Professional Journalists. 6/05, John W. Patton Scholarship winner, Wesleyan Writers Conference. 3/04, First Place Multiple Page Feature Picture Story, Pictures of the Year International Competition. 11/02, First Place General News Photograph, National Press Photographers Monthly National Clip Contest. 4/99, Pulitzer Prize for Breaking News Coverage as a member of the team covering the murder of executives of the Connecticut Lottery. 9/95, Third Place Feature Photograph, Society of News Design. 9/92, Third Place Sports Photograph, National Press Photographers Monthly National Clip Contest. 9/87, First Place Sports Photograph, 1987 New England Associated Press News Executives Association Annual Photo Contest. 10/86, First Place Sports Photograph, National Press Photographers Monthly National Clip Contest. 7/86, First Place Spot News photograph, 1986 New England Associated Press News Executives Association Annual Photo Contest. 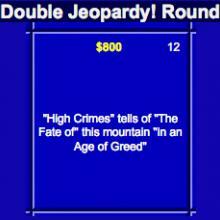 High Crimes: The Fate of Everest in an Age of Greed appeared as a question on the game show Jeopardy! in the category of Nonfiction on December 4, 2009. "'High Crimes' tells the fate of this mountain in an age of greed." “Talking about. . . Mt. Everest. Dave, back to you."